These are the words of Joe Perry, the lead guitarist of American Rock band Aerosmith. India, since time immemorial, has distinct cuisine flavors to offer. Whether it’s the South Indian curries, the West Indian flavors or the North Indian piquancy, Indians simply cannot satiate their taste buds without spices. Early cooks used stones to grind spices which have now been replaced with mixer grinders.These are highly versatile and you can grind, blend and powder herbs, spices and condiments without affecting their natural aroma and taste. For your convenience, we did our research and came up with 10 best mixer grinders for your daily use. Before you begin, it is important to keep a few pointers in mind that help you make better informed buying decision. Let us scrutinize these. which ensure that your machine does not operate until the jar is secure with the base unit. This helps avoid accidental turning on of the machine with lid still open or hands inside jar. 2) Attached vacuum footing cups. Although these are small accessories, they ensure that appliance is grounded firmly to surface it is resting on and does not slip easily. Most food mixers come with pre-determined capacity they can handle. Increasing load can lead to motor bursting. Most mixers today come equipped with Automatic overloading protection. It is advisable that you buy a food mixer that has this feature. What it does is, it cuts electricity supply when overloaded. This way, chances of accidents and damage are reduced. This will ensure food does not float when the mixer reaches its highest RPMs. 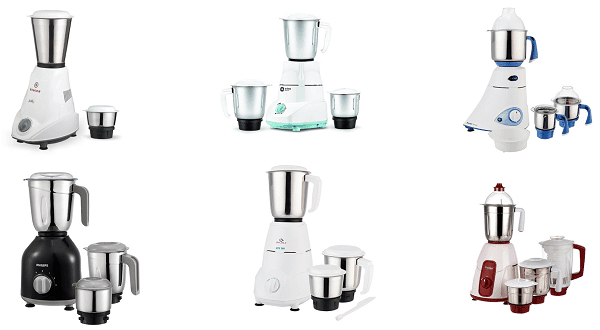 For your convenience, we have researched top 10 food processors in India for your buying convenience. 1) Bajaj offers premium appliances for daily household chores. 2) It has been a trusted brand across India for more than 50 years. 3) The Bajaj 500-watt Food processor is an optimum pick among a sea of options for food processors available in market today. 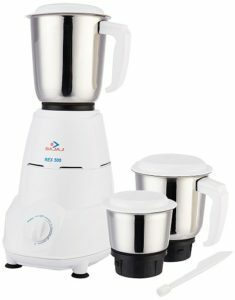 4) The Bajaj mixer grinder comes with 3 jars of different capacities. 5) These jars can be used for liquids, making chutneys and for various other multipurpose chores. 6) The machine is made up of durable plastic and solid steel jars. 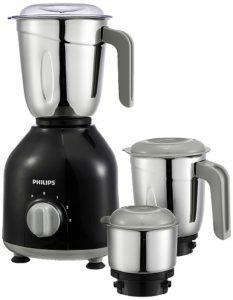 1) The 750-watt Philips juicer mixer grinder is an economical product full of features. 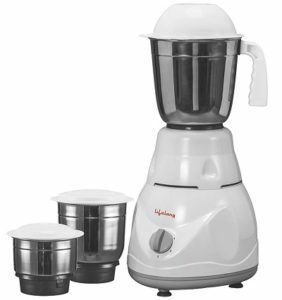 2) With this food processor, there is no need to chop fruits into small pieces. 3) Its powerful blade is capable of juicing even the most ambitious of fruits. 4) The seeds and fruit skin is separated individually with the fruit filter that comes with the set. 5) There is no installation required while setting up the grinder for first time use. 6) The sturdy steel jars have revers Quadra flow technique for preventing food from sticking to the walls. 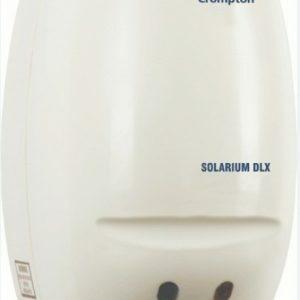 7) It has 500-watts of power and hard blades ensure smooth results within seconds. 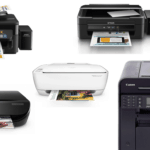 1) Lifelong Online offers a diverse array of home appliance and personal care products. 2) Their Power Pro mixer grinder is designed to perform versatile jobs for you to make life easier. 3) The turbo mixer grinder has solid, durable finish. The 3 jars are fabricated with stainless steel, which is not only sturdy but rust-free. 4) The structure is supported by durable vacuum feet for convenient operation. 5) The mixture grinder also has an overload protector which safeguards machine during power surges. 6) The jar lids are ergonomic and have easy grip to fit the mixer top tightly. 7) The mixer’s powerful blades produce fine textured outputs. Some report that the machine releases a burning smell .But it will go after 4-5 uses. 1) Eveready, with its 100 years of dedicated services through its products in India, has made a home in the heart of people. 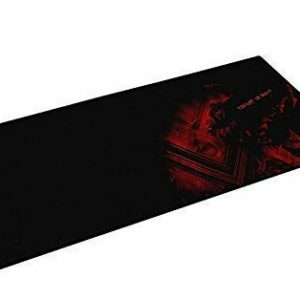 2) Their products are affordable and durable. 3) The Glowy 500-watt mixer grinder has the right balance of power and features to help you achieve difficult blending preparations. 4) The motor attached to the food processor is heavy duty. 5) The regulator is equipped with pulse control which helps in adjusting speed of blades as per requirements. 6) The food mixer is accompanied by 3 jars of varied capacity; suitable for all types of blending chores. 7) The jars are made of resilient stainless steel and made to last. 8) The ease of cleaning and maintaining make it ideal for every bachelor or single homeowners out there. 1) The company is known for its premium quality products and efficient customer services post sales. 2) The 750-watt food processor has superior grinding performance with ease of use. 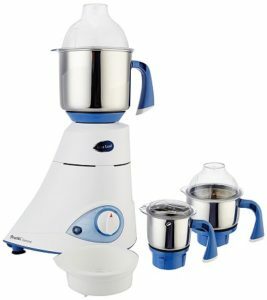 3) The food mixer has a powerful 750-watt and 230-volt motor with adjustable speed controller. 4) The steel blades of motor are machine ground for superior grinding outputs. 5) The mixer grinder has a shock-proof ABS body to prevent electric shocks. 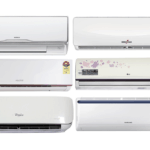 6) The appliance also has a sensitive heat cut-off system to protect against voltage fluctuations and overloading. 7) The model is accompanied with 4 sturdy and stainless steel jars of varying capacities. Long life ABS body and stainless steel manufacturing of jars. Auto cut-off feature during fluctuations during power surges. 2-year guarantee and lifetime warranty by the manufacturer. Ergonomic, easy grip handle for comfortable hold and suitable for both dry and wet grinding. Some users report that the jars are not easy to clean after use. For over 60 years, Orient Electric has been offering diverse selection of consumer electric appliances and solutions including lighting, fans, kitchen appliance and switchgear. 1) The division is part of the diverse Indian Conglomerate CK Birla group. 2) The multi-purpose Kitchen Kraft mixer and grinder is part of premium kitchen appliances by Orient Electric. 3) The food processor boasts of an ergonomic design. 4) It has compact body and a sleek construction, not only saving you kitchen space but adding a graceful contour to your kitchen shelf. 5) The motor is heavy duty to undertake challenging grinding, mixing and juicing. 6) It is energy efficient and creates fine textured blends without deteriorating the nutritional value of ingredients. 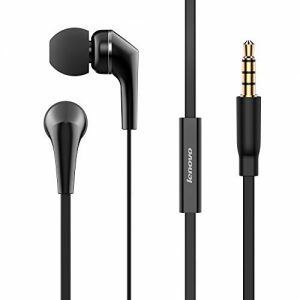 The 2-pin cable is not preferred by some users. TTK Prestige Limited, is among the giants of kitchen appliance manufacturers in the Indian marketplace. Prestige is the preferred brand for new brides and seasoned housewives alike. 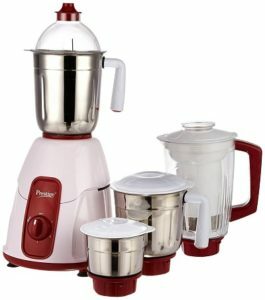 1) Their diverse range of kitchen essentials are trusted nationwide. 2) The 750-watt mixer grinder is another choice offering by company. 3) Prestige food processor has a stylish grinding jar that caters to every grinding texture from soft, small and hard ones. 4) The jars are solid stainless steel with option to drain excess water to facilitate better grinding. 5) The containers are fitted with multi-purpose sharp and durable blades. 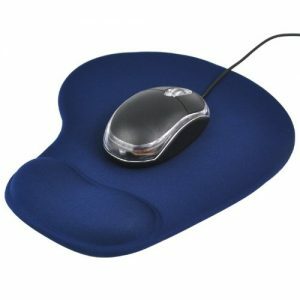 The handle grip is ergonomic, ensuring comfortable grip during operating. Transparent juicer jar to watch juice levels. 1) Wonderchef provides premium quality kitchen products in diverse ranges of bakeware, cookware, knives, accessories and tools. 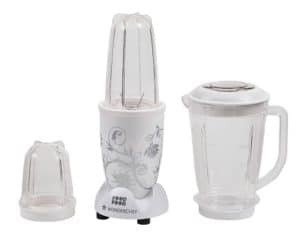 2) The Nutri-Blend food processor by Wonderchef is your trusted kitchen companion. 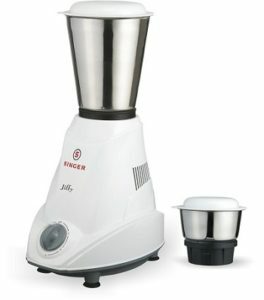 3) Nutri-blend mixer grinder is attractive, compact and easy to store. 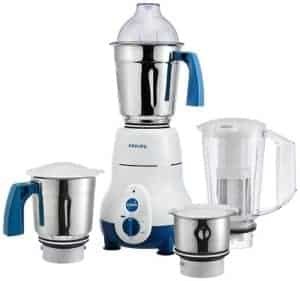 4) It has detachable and interchangeable component parts for making recipes, milkshakes and chutneys quickly. 5) The two interchangeable jars have varying capacities of 300ml and 500ml. 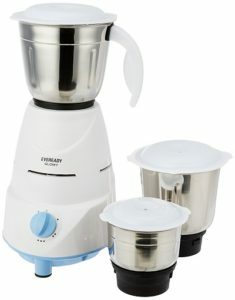 6) The unit has a rust proof plastic body as well as 2 sets of detachable stainless steel grinding and blending blades. 7) Nutri-blend is suitable for both wet and dry grinding. The base of the unit has non-skid rubber soles that allow for convenient operation. Quick push function for on and off. Easy cleaning with detachable parts. 2-year warranty on product from manufacturer. Check service center availability before buying. 1) Featuring again on the list is Philips, the internationally acclaimed brand for electrical, home and kitchen appliances. 2) The 750-watt mixer grinder is feature rich and is value for money. 3) The high capacity motor is powerful enough for grinding tough food items such as dry coconuts or roasted lentils. 4) The HL7756 is compact and fits the kitchen platform perfectly. 5) In the 750-watt power category, this is perhaps the smallest sized appliance. The food processor comes with 3 jars of varying capacities. 6) The largest and smallest jars are for wet grinding and the middle sized one is for dry blending. 7) The wet grinding jars are equipped with rubber gaskets to prevent leakage. 8) The jars are hade of high quality stainless steel, convenient to clean and have easy grip handles. Sleek, compact and easy to store design. Unique blade design for effective grinding. The base has only 3 legs; you need to put the food mixer on a stable surface before starting so that it does not turn over. 1) Known for their superb sewing machines, Singer is an absolute favorite for enthusiastic homemakers. 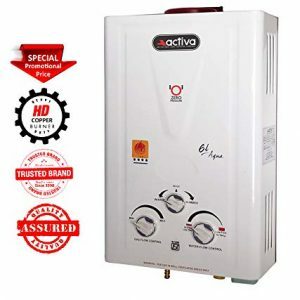 2) They provide choice electrical appliances for home and kitchen needs. 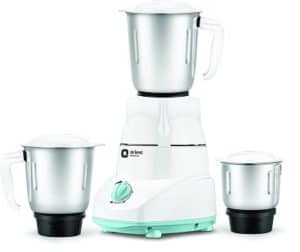 3) The Jiffy 500-watt mixer grinder, true to its name, can mix, grind and mince with finesse and is a valuable addition to your kitchen shelf. 4) The Singer food processor has a 500-watt motor with a 3-speed control for varying the speed per blending requirements. 5) The mixer also comes with an overload protector for power cut-off during overload. 6) The food mixer has an anti-shock body to prevent electric shocks. The base has anti-slip vacuum feet to prevent spillage by turning down. 7) The jars have unstained nickel-steel plated blades that offer best mincing results. We hope our detailed reviews will help you in your buying decisions. Instead of going by marketing gimmicks of sales in a shop, you now have an idea about the consideration factors to weigh your buying decision. A food processor is a long-term investment, make sure you settle for a good one.